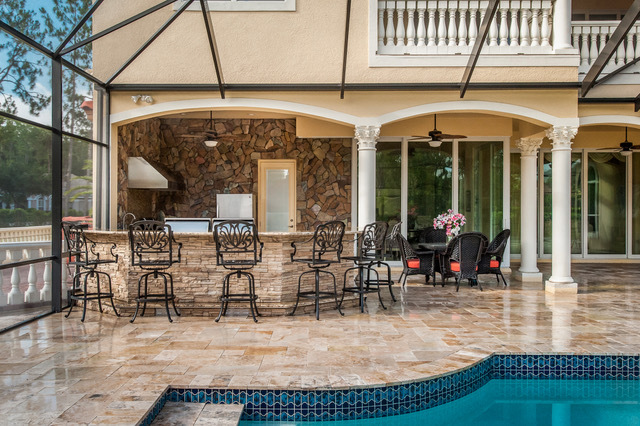 Living in Florida, an outdoor kitchen or living area is practical for almost every single day of the year. The team at Premier Outdoor Living & Design wants to create the outdoor kitchen and living area of your dreams. No matter the size or budget, Premier collaboratively works with you to design the optimum solution for your backyard. Their relentlessness in creating the perfect setting is why so many customers continuously seek their help, at every new home they move to. One particular Florida family, the Blackmans, called Premier Outdoor Living & Design for help on their third project with them. On the most recent occasion, they were seeking help in creating a large outdoor kitchen featuring flagstone on the walls of the house. There are many other focal points to the kitchen including a gas stove, full-size refrigerator, microwave, large vent hood, wine cooler, side-by-side gas and charcoal grill and much more. The doors and drawers used on in the kitchen space are made by All Pro Stainless Products, the best outdoor rated products for the Florida outdoors. Perfect for entertaining guests, the space boasts bar seating for six to seven people. A unique feature of the outdoor kitchen is remote controlled LED lights, allowing the homeowner to change the ambiance from a party atmosphere to a small gathering atmosphere, with the flick of a switch. The project perfectly ties together the indoor area of the home seamlessly to the backyard and pool. It has become the central entertaining location for the Blackmans. A client new to Premier Outdoor Kitchen & Design was looking to transform her backyard. Previously, the area had featured landscaping and gardening which required a lot of time and energy to manage. The backyard was remodeled into a more low-maintenance living space and became an extension of her home.